By knowing what you don't know. 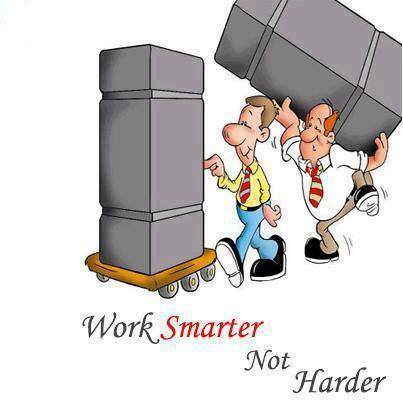 The whole point of working "smarter, not harder," is to do more with less, to move faster than normal, to get to the end result in a more effective way than before. It's the cerebral way of saying, "Instead of getting 10 men to carry this huge piece of stone, how can we build ten wheels to carry the stone and just have one man guide it?" The key to working "smarter" is to—if we want to break it down—find solutions through creative means as opposed to brute force: "working hard." A lot of people mistake working long hours for working intelligently. They break a sweat, feel stressed, overwhelmed, etc., and assume these are all signs of them doing a job well done. Sometimes this is the case, but sometimes it's also the opposite. These can just as well be clear signs that you are taking the more difficult path. You are trying to do everything yourself. Leaders, captains, orchestra conductors, they all share the same quality: They don't play the instrument, they play the orchestra—the collective. (Stole that from the recent Steve Jobs movie because it is very true.) The ones leading the charge aren't the best stone cutters or heavy lifters or violinists. But they are the best at knowing what needs to get done and finding the right person to fulfill that job. So while the first violinist might say, "Why are you in charge? I am the best here at what I do," the leader would then respond, "I am in charge to give you the opportunity to be the best at what you do. I create the moment." In order to work "smart," you have to know what you don't know. You have to be willing to say, "This isn't in my wheelhouse of skills and I need someone who can take care of this for me." You have to know enough to understand what minutia needs to be executed on for the task, but not so much that you consider yourself the expert of everything and thus you don't need anyone's help. You won't get anywhere that way. You will end up staying late at the office by yourself doing everyone else's work because you are hyper-focused on the trees instead of playing witness to the forest. This is the single most effective way to do more, better, faster. Delegate. Instead of trying to do everything yourself, leverage the help of those around you. Think about how long it would take you to carry 10 boxes from your bedroom to the end of the driveway. Now imagine how long it would take you if you enlisted nine other people. 10 trips just turned into 1 trip. Especially in the world of business where your "product" is often the management of hours, delegation is your most effective solution. Instead of creating everything from scratch, see what you've created before that you can re-use (again and again). The whole idea behind efficiency is to do something once and yet have it used more than once. The more times it is used, the more your theoretical "creation cost" continues to go down, because you are making up the difference on the back end. If you create a $10 product in 1 hour, but you value your time at $100/hr, then you need to sell 10 products in order to "break even" on your investment of time. However if you go on to sell 50 products, then you you essentially invested $100 of your own time (which is money) but saw a return of $500. This is a clear example of how, by working "smart" and creating once but leveraging over and over again, you see a much larger return on your investment than if you were to value your time at $100 and work for 5 hours to reach that $500 mark. Same end result, but you can either get there by working 1 hour or 5 hours. Having a To Do list of 50 different things is overwhelming, and what makes it taxing is trying to bounce between different modes of thinking: one To Do might be something creative, another might be more analytical, etc. If you haphazardly go down the list, you will waste a lot of energy bouncing between very different demands. Instead, "chunk" your To Dos into similar categories. Here are all my boring-housekeeping things, here are my creative tasks, here are all my finance/numbers To Dos, etc. This will help you find your groove and move from task to task quickly and efficiently. You will be much more effective if you can get clear on what you need to before you step into the office, before you open your e-mail for the day, before you start welcoming in the demands others place upon you. If you can plan ahead for the day, the week, the month, even the year, you will see where you want to go and you will better understand how to get there—which in turn creates your To Do lists and makes your actions more meaningful. Don't invest your time just for the sake of "being busy." Invest your time in the areas where you will see the highest return relevant to your goals/objectives. This is an idea I hold close because it is the foundation upon which we have built our family of companies, starting with Idea Booth: Powerful Ideas. Stronger Reactions. The whole idea behind the way we approach creative problem solving is to know that we don't have all the answers. How could we? Better yet, how could anyone? Deep, specialized knowledge is a valuable rarity. Instead of trying to do it all ourselves (working "hard"), we seek to surround ourselves with those experts and leverage their own expertise (working "smart"). "The Collective" as we call it here at Idea Booth is comprised of the best and brightest within their industry/niche, and they provide the counsel that is needed to take the project at hand to a level that would be impossible for any one-stop-shop. In short: We know what we don't know—and that's a good thing.